With over 30 years of legal experience, attorney Lana Hawkins has the skills and resources necessary to handle even the most complex and challenging cases. An award-winning attorney, she is widely recognized as one of the top family law and trial attorneys in the state. 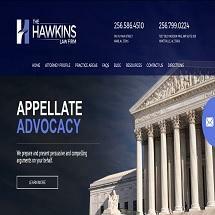 A native of Arab, Ms. Hawkins genuinely cares about the legal issues that affect the citizens of our community. With a dedicated team of legal associates and support staff, she and our law firm are ready to provide the assistance and support you need for virtually any legal issue you face. For more information about how The Hawkins Law Firm can best serve your legal needs, you can contact our law office to schedule a free initial consultation.